Hi Folks, I’ve seen lots of recommendations of turning between centers. However, what would I do if I didn’t get the Nova chuck? I don't know exactly because I don't know what you have. "Necessity is the mother of invention." I had a problem with CA consistently lifting off the end of the turned blank when separating the bushings from the blank on oily wood. It was plum aggravating. Two people on this forum had mentioned in the previous 6 months about a strange method of not using a mandrel, just a drive center and a live center with the blank between. It wasn't even named TBC at the time, in fact no name. I was overseas at the time and didn't have quick access to a "drive center". I dreamed up what was needed and turned a drive center (out of a short aluminum rod) that I stuck into a drill chuck on my lathe. There are some special bushings that need 60° live and drive (dead) centers but unless you have these specific bushings, most any live center & drive center will do. I used a method to make game calls that was similar to TBC without a mandrel. So here is an idea, your spindle is 5/8 diameter. Drill a block of wood, 2x2x4, from the 2x2 end with a 5/8" hole 1" deep. On the end you drilled, drill and tap for a 1/4-20 set screw. Mount the block on your spindle, turn round, then taper the front to a 1/2" diameter, then drill to fit a small piece of pen mandrel. It should sort of look like the PSI TBC set up. This will wear out, so plan on making more as needed. Have access to a metal lathe, make one out of steel. Lately, I’ve been trying this: https://www.exoticblanks.com/Turn-Be...Shopsmith.html in its mt #2 version. You mount conventional bushings onto short lengths of mandrel rod at each end. No need for special TBC bushings which can be hard to find sometimes. So far, after maybe 25 turnings I’m pretty happy. At first, I was concerned by some “play” when the blank is mounted onto just one side, but when I bring in the tail stock side, it all tightens down and is very well centered. You most likely have been using a mandrel up till now. . The mandrel needs to be driven. Sometimes to drive a mandrel you grip it with a chuck, but if you don't yet have a chuck, I would assume that your mandrel has a Morse Taper arbor that fits into your headstock spindle. . Some arrangements have the mandrel threaded and screwed into the arbor. . That thread is often a standard 1/4" thread (either National Coarse or National Fine). . So instead of screwing the mandrel into the arbor, you could screw a 1/4" bolt into the arbor. . If you sharpen the other end of the bolt (after removing the head) you can use that to drive your turning stock. . It would be best to machine the sharp point rather than just grinding it. I have used that method for years. Without knowing exactly what the headstock configuration of your lathe consists of, it is a little hard to make a concrete suggestion, but I hope that some idea comes to you. You will never regret making the transition to turning between centers (TBC). Let us know what you come up with. . Getting the chuck will be a bit help. Last edited by magpens; 02-06-2019 at 09:29 PM. What a great collection of ideas and references! Dogcatcher is correct. My Shopsmith has a 5/8” spindle with a flatten side for setscrews, which are required for all attachments. I have a 1/2” drill chuck and a ‘regular’ drive center for lathe work. As I mentioned I have a 4 jaw chuck on the way which will help immensely. I’m presently using a 7mm mandrel made for the Shopsmith spindle, and some of you may remember my concerns about vibration, with the resulting advice to switch to TBC. application of pressure from the (in my case) quill, to the blank, ending at the live center is what holds the blank it place for turning. Is that correct? 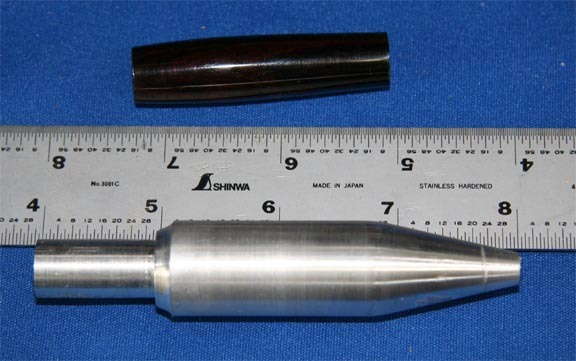 It also seems that there are a variety of tapered point implements I could make that would also work...does that relieve one of having a bushing for every pen in creation? I have 2 new pen kits, one is the ‘Princeton” which is only one piece anyway. If I understand you correctly, that’s not quite right. TBC usually starts with a dead center at the headstock- a 60 degree conical taper which drives the blank and a live center, also 60 degree conical at the tail stock quill. You can simply press these cones into the brass tubes and turn, and lots of people who are way better than me do just this and swear by it. It doesn’t work well for me because I habitually overtighten my quill and doing so you can easily distort the tube end and/or crack the blank if you’re turning it very thin at the ends. But if you do it this way, you are correct that you don’t need bushings at all. I think most TBCers use TBC bushings which don’t necessarily need to be specific to the kit, but must be specific to the tube diameter and ideally smaller than the diameter you are turning to. My experience is that these are not so widely available as conventional mandrel bushings. You also can use conventional bushings between the centers, but this doesn’t work so well in my hands either. Yes, it is the pressure from the tailstock (through the live center) which you rely on. . That pressure is significant because it "creates" the frictional force at the drive center which keeps your workpiece turning. . Now, having said that that pressure is significant let me add that it is often cranked up to a level that is not really necessary. . So you have to be careful not to make it excessive ... just enough to keep the workpiece turning while you are shaping it. . "Play it by ear", if you know what I mean. . Too much force can reduce the life of the bearings at both ends. And, yes, to your question about the bushings. . When turning between centers, you actually do not need any bushings whatsoever. . You CAN use bushings but if you do, then you are negating some of the advantages of the TBC technique. . With the "pure" TBC technique (without bushings), you do your sizing through careful and frequent measurement using digital calipers. . Be mindful that there are some "hybrid" TBC techniques which do incorporate bushings as an aid to sizing. You would realize that when you use a mandrel and bushings you have similar longitudinal pressure and this pressure is transferred from your lathe headstock and tailstock through the steel bushings to the turning workpiece. . The mandrel acts only to stabilize everything and keep it all on the same axis of rotation but the force (or pressure) is through the bushings. . Without the bushings, the force is applied between the driving center (or dead center) at one end directly to the workpiece and the live center (in the tailstock at the other end). . You crank up the force with the tailstock and the headstock reacts with an equal and opposite force in the opposite direction. If you use a "mandrel saver" it plays a role in transferring force too. It's all basic physics which you would know. To acknowledge Gregory's warning ... without any bushings whatsoever, the application of force by the two centers (to the glued-in brass tube internal "corner" at both ends) is more concentrated. . With excessive force you certainly can damage the brass tube and the blank material which is glued around the brass tube. . You don't want that to happen. . You need to "get the feel" for how much force is necessary for the blank to spin and how much puts you in the "danger zone". . It is important to take it easy and "get the feel". . Keep your cuts very light until you do. . It is not that difficult and it is well worth developing the skills for this technique. However, I would disagree with Gregory where he says " I think most TBCers use TBC bushings" ... I'd say most don't use bushings at all. Last edited by magpens; 02-07-2019 at 12:18 AM. The 60° is not necessarily required. A 60° tail stock IS a requirement in the little cup in the end of a mandrel, or with special 60° machined bushings, but if using normal (made for mandrel) bushings for TBC, it (60° drives) is NOT required, Some angle is required and 60° will most certainly do, but that specific angle is not a necessity. Look at the pict I posted in post # 2. that was the first drive center photo posted on this forum 11 or 12 years ago. It is not 60°, and it worked with using bushings made for mandrel use. it even has a blunted end on the nose cone. I agree with you on the use of bushings to get things started and rounded. I tend to flair the ends of the tubes if I don't use bushings at the beginning. As soon as I am ready to apply finish (after measuring with calipers for sizing) I take the bushings off and finish. Last edited by leehljp; 02-07-2019 at 12:35 AM.
. . . With a Shopsmith . . .
A tip'o the hat to a fellow Shoppy owner. I started out on my Shopsmith, but got a good deal on a Jet 1724. It is nice to turn and cut without tearing down equipment... but I love my Shoppy!! It seems you've found the "converter" to thread that chuck onto the Shopsmith... You're gonna love it!